In 2016, a President’s Commission on Slavery and the University (PCSU) task force dedicated to creating a historical trail completed the first phase of re-inscribing the history of slavery and the life stories of the enslaved back onto the 21st century academic landscape with creation of a walking tour map. The task force included PCSU Co-Chair and History Professor Kirt von Daacke, Vice Provost for Academic Affairs and Art History Professor Maurie McInnis (now the Provost at the University of Texas-Austin), and Archaeologist Ben Ford of Rivanna Archaeological Services. The task force also included UVA students Alice Burgess (2015-16 Memorial for Enslaved Laborers Chair & University Guide), Henry Hoffman (University Guide), Moses Abraham (University Guide, BSA, JUEL project research staffer), and Lili Bettolo (University Guide). The task force designed the tour and crafted the text for each stop. 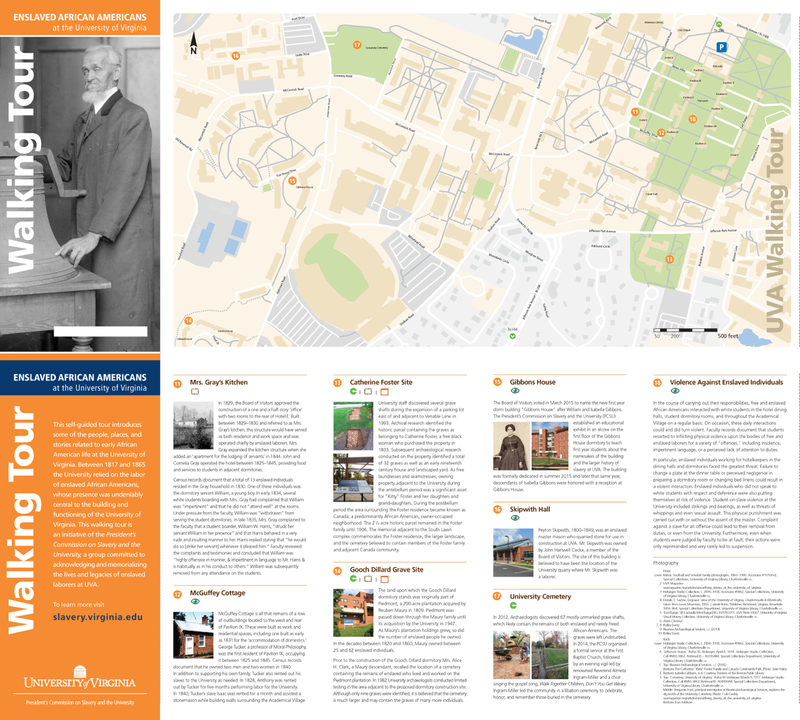 The map’s visual design and layout were done by Charlottesville graphic designer Anne Chesnut. 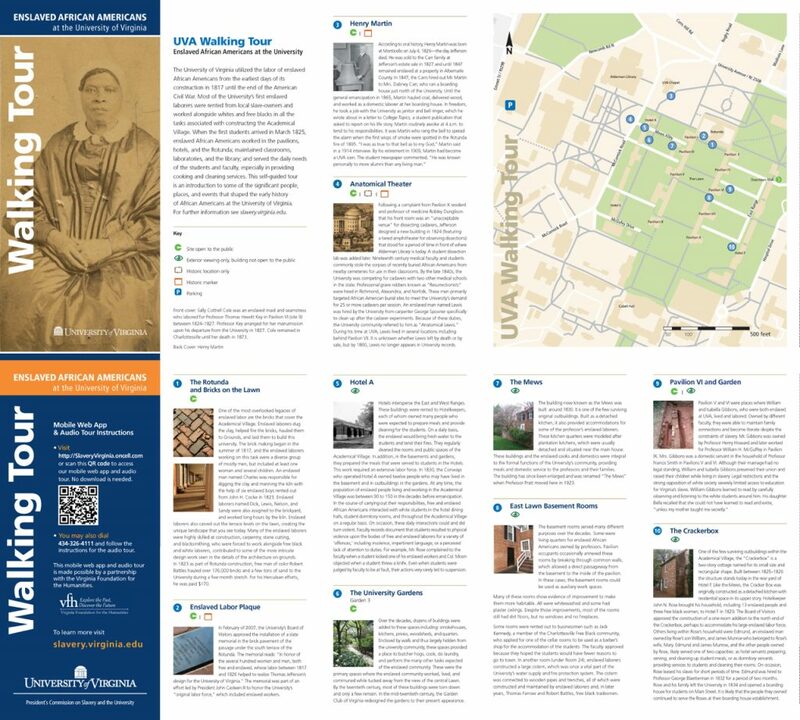 This self-guided tour introduces some of the people, places, and stories related to early African American life at the University of Virginia. Between 1817 and 1865 the University relied on the labor of enslaved African Americans, whose presence was undeniably central to the building and functioning of the University of Virginia. During the building of the University from 1817 to 1825, dozens of enslaved people, rented by the school, yearly labored on nearly all aspects of construction. Between 90 and 150 (sometimes more) enslaved people lived and worked on Grounds each year after the University opened its doors to the first session for students in 1825. From 1825 on, the university itself typically rented between five and ten people yearly plus others for shorter terms. Faculty living in Pavilions owned/rented between 4 and 7 enslaved people on average and hotel keepers controlled 20-35 additional enslaved people each. The map is available in the new Rotunda Visitor’s Center. Visitors can also go to http://slaveryVirginia.oncell.com to access the mobile web app and audio tour (no download is needed); or dial 434-326-4111 and follow instructions for the audio tour. This mobile web app and audio tour is made possible by a partnership with the Virginia Foundation for the Humanities. Click HERE to view a PDF of the map.